The David Bowie Statue is a bronze sculpture of David Bowie sculpted by Andrew Sinclair and unveiled in 2018 in Market Square, Aylesbury, Buckinghamshire by Howard Jones. The statue was unveiled in 2018 in Aylesbury where Bowie debuted his Ziggy Stardust character. Entitled "Earthly Messenger", it is situated in Market Square. It features a likeness of Bowie from 2002 and a selection of his alter egos down the years, with Ziggy at the front. Speakers mounted above the life-size piece play a Bowie song every hour. The statue received mixed reviews. Online art magazine Artlyst described it as "hideous", poorly rendered and not fitting a man (Bowie) who loved fine art. Rob Stringer, CEO of Sony Music, described the statue as “beautiful”. Less than 48 hours after the statue was unveiled, it was vandalised. "Feed the homeless first" was written in front of it, "RIP DB" on a wall beside it and a section of the statue was painted on. In October 2018, it was vandalised for a second time with graffiti sprayed onto the staue, some pavements, doors and hoardings. ^ "Musical David Bowie statue unveiled". 25 March 2018. Retrieved 11 March 2019 – via www.bbc.co.uk. ^ "David Bowie Statue Not Fitting A Man Who Loved Fine Art". Artlyst. Retrieved 11 March 2019. ^ "Musical David Bowie statue vandalised". 27 March 2018. Retrieved 11 March 2019 – via www.bbc.co.uk. 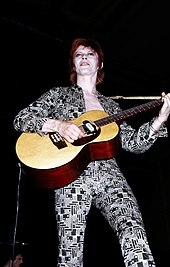 ^ "Aylesbury's David Bowie statue vandalised..again". Mix 96. 11 October 2018. Retrieved 11 March 2019. This page was last edited on 14 April 2019, at 10:35 (UTC).